Review With its music store and cloud syncing services, Ubuntu 10.04 tends to eclipse Fedora in the minds of many. Not that Fedora project leader Paul Frields minds. He's told me in the past that Fedora is intended "first and foremost for users interested in and capable of contributing to open source." And when I spoke to Frields shortly before the release of Fedora 13 - out today - he reiterated that point. "We want a culture of contribution, not just consumption," he said. That focus on the more tech savvy, contributing users is reflected in Fedora 13, where you'll find open source, 3D-capable graphics drivers, excellent Python tools, some very nice color management tools, and other less flashy improvements. Fedora 13 offers open-source 3D acceleration for Nvidia graphics cards. Previously, 3D support was to be had only through the proprietary drivers. The new Nouveau drivers mean those of you with Nvidia cards now have an open-source option that still offers 3D support. While that will appeal to free software enthusiasts, it also - perhaps more importantly - means that Fedora can be repackaged and distributed without any fear of proprietary drivers. If you've been using the old, proprietary Nvidia drivers, I highly suggest giving the open source versions a try. The drivers are part of a longer-term plan. Frields points out there is already 3D support in the open-source Radeon and Intel drivers in Fedora and together the three open drivers pave the way for a more complete 3D stack. With GNOME 3.0 coming up, 3D is going to be more important for more users and Fedora stands above the crowd when it comes to open driver support. Other new, driver-related improvements in Fedora include support for a host of new webcams, including the new so-called dual-mode cameras. Another big area of development is virtualization. Red Hat has decided KVM is the future of Linux virtualization. The recent RHEL 6 beta dumped Xen in favor of KVM, and Fedora is no different. New features in KVM include the ability to reserve PCI addresses for guest virtual machines and give virtual machines a shared physical network interface so that guests appear independently on the same network as the host machine. While neither of these new features will matter to desktop users, they go a along way to making Fedora a more compelling choice for production servers running multiple virtual machines. Of course, Fedora 13 isn't all technical changes under the hood. In fact, this is probably the most user-friendly release yet from the Fedora community. 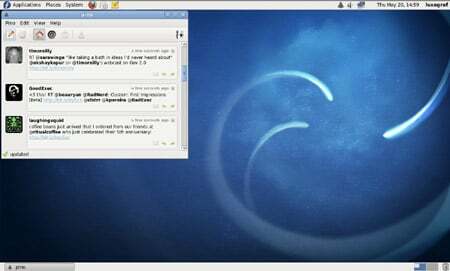 Lest you think Ubuntu is the only "fun" distro out there, Fedora 13 does have a few nods to current trends in the Linux desktop, like the inclusion of Pino, a social networking app that can connect to Twitter and Identi.ca. Pino gets menu-bar status in this release of Fedora and offers roughly the same experience as gwibber, which shipped with Ubuntu. Fedora 13 also boasts an entirely new color management system - courtesy of Fedora contributor Richard Hughes - for the Gnome desktop. The new profile manager makes it easy to install vendor-supplied ICC or ICM profile files - just double-click them to config. For the average person, color management probably never comes up. You turn on your monitor and it's done. But for graphics professionals and photo enthusiasts this is a fine art. Indeed, one of the reasons Apple's OS X is popular is it makes it easy to manage color profiles. If Ubuntu really wants to mimic OS X, it would do well to steal the new color management tool from Fedora 13.